Spray 12-inch nonstick skillet with cooking spray. Sprinkle pork chops with peppered seasoned salt. Cook pork in skillet over medium heat 5 to 6 minutes, turning occasionally, until brown on both sides. Spray 5- to 6-quart slow cooker with cooking spray. Mix remaining ingredients except cheese in cooker. Arrange pork on stuffing, layering as necessary. Cover and cook on Low heat setting 5 to 6 hours. Remove pork from cooker. Stir cheese into stuffing in cooker until melted. Serve pork with stuffing. 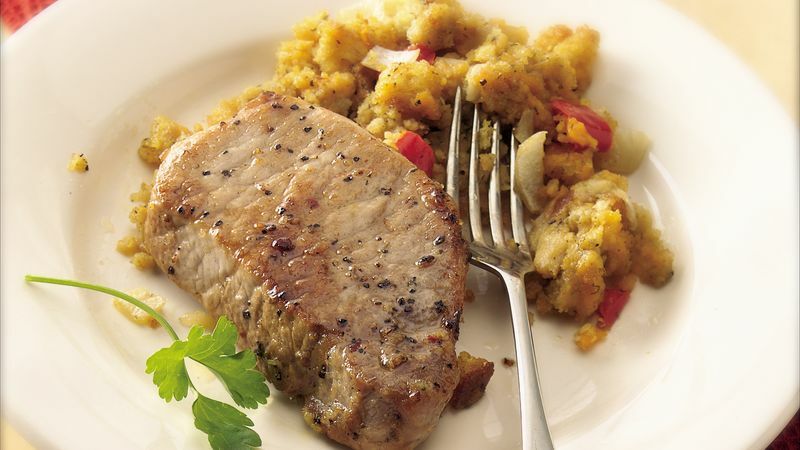 Instead of the boneless chops, you can use lean bone-in pork loin chops. Before cooking, trim any excess fat. If you’re short on time, you don’t have to brown the meat. This southern-inspired dish is delicious with frozen mixed vegetables, applesauce and crusty rolls.